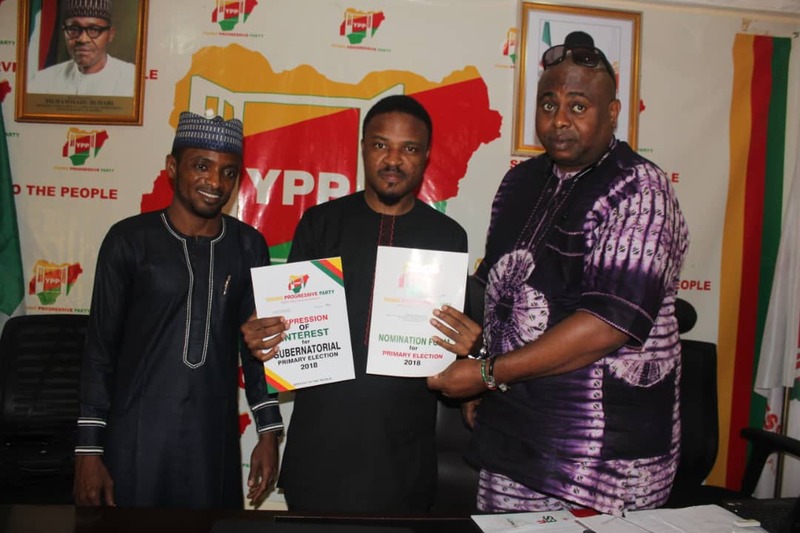 As battle for 2019 general elections heats up across the country, the Young Progressives Party (YPP), may have added an interesting twist to the governorship race in Abia State with the entrance of a 36-year-old, Joseph Nkoro, as he picked the party’s governorship nomination form on Monday in Abuja. Nkoro, who appears to be unopposed in the governorship candidature of the party, would be slugging it out with the incumbent Governor of the State, Dr. Okezie Ikpeazu, former Managing Director of Diamond Bank, Plc, Dr. Alex Otti, who squared up with Ikpeazu in 2015 election, an oil mogul, Dr. Uche Oga and a host of others come February, 2019. Addressing journalists after obtaining his forms from the YPP national secretariat in Abuja, Nkoro, a graduate of Mechanical/Production Engineering from Nnamdi Azikiwe University, Akwa, Anambra State said his reason for throwing in his hat in the political ring was propelled by the failure of leadership in the state. He decried the lack of infrastructure, stagnated economy and the relegation of the youths to the background, adding that championing the cause of the youths formed part of his reasons to run. The young governorship aspirant hails from Nnentu in Aba South local government area of the state. He called on the youths of the state to support him to give Abia a facelift, stressing that the previous governments had failed the people. Asked how he intends to prosecute the task ahead given the huge financial obligations it entails, Nkoro said that it was not about money but the vision and mission. He said: “I have been an avid follower of what has been happening in Abia State all these while and I have seen that there is a lot of suffering in the state. There is a lot of backwardness. But I have always had the belief at the back of my mind that a lot could be done: the state of infrastructure, the economy even the youth are jobless, doing nothing. “ I have thought about these things and I know I can do a lot for my people. We have a serious leadership issue in Abia State. I decided to make myself available to right all the wrongs in the State. By the grace of God and with the support of the people, I am the next Governor of Abia who will change the leadership narrative in the state. “I was born on May 17, 1982. I am 36 years old this year. I am from Nnentu in Aba South Local Government Area of Abia State, so that makes me an Ngwa man. Asked if it was not a Herculean task for him to face governor Ikpeazu and others in the contest, Nkoro said he had no apologies for his decision to take his state out of the economic and political woods by providing the lacking leadership. “Actually, Dr. Okezie Ikpeazu, the present governor of the state is from my senatorial zone, Abia South. But since the reason I have come out is essentially as a result of leadership failure in the state, I have apologies coming out to do what is right. “Now, concerning the other contestants, I am confident. Leadership is about what you have to offer and NOT about money. I have the support of the youths and I am stilling calling on every single youth, every young person in Abia state, I need their support and vote to become the governor and change things in the state. “Look, the youths have been relegated to the background by the previous governments. You asked for their support, they gave you and eventually they are pushed to the back. I am the easiest route for the young people to get to the government. So, it is not about money but what you have to offer. This particular election in 2019 is about competence, yes Abia state guber election 2019 will be zoned to competence not to any senatorial zone!” he added. He however, called on Ohaneze Youth wing which he said represents the entire Igbo youths and other Nigerians to support the Presidential bid of Prof. Kingsley Moghalu instead of seeking the VP slot from the PDP for an igbo man. How Former Nigeria’s Defence Chief, Alex Badeh Was Shot Dead.